Now that I have recently backed a Kickstarter (The PaperLike iPad Pro screen protector) and an Indiegogo campaign (The Love Notes to Newton Documentary), I am now getting emails from both more than ever before. I typically don’t bother looking at them, but I noticed one recently for a product that looked like it was specifically designed for me. 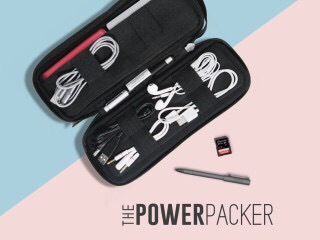 The Power Packer from Side by Side, which has already been fully funded and completed on Kickstarter and is also in the midst of a very successful Indiegogo run, is an accessory and cable organizer designed with the gadget-obsessed in mind.